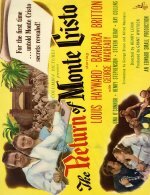 Louis Hayward, star of 1940's Son of Monte Cristo, returns to Alexandre Dumas territory in Columbia's Return of Monte Cristo. This time, Hayward plays the grandson of his namesake Edmond Dantes, who, it will be recalled, was cheated out of his fortune and falsely imprisoned, only to escape and wreak vengeance on his betrayers by assuming the guise of the Count of Monte Cristo. Just like grandpa, the younger Dantes is framed by a trio of connivers and shipped off to Devil's Island. Escaping with a fellow convict, political radical Bombelles (Steven Geray), Dantes adopts the bearded guise of an elderly man in order to destroy his enemies and reclaim his birthright. One of his principal antagonists - at least during the first half of the film - is haughty aristocrat Angele Picard (Barbara Britton), who because she wasn't a part of the original conspiracy genuinely believes that Dantes is a criminal (This is the sort of pre-Political Correctness film in which the hero robs and ties up the heroine, but she falls in love with him anyway). After orchestrating the ruin of two of his tormentors, Dantes settles accounts with main villain Henri de la Roche (George Macready) in a darkened theater, a climax that invokes memories of Rafael Sabatini's Scaramouche.